Today’s feature is John Woo’s 1997 hammy acting showdown, Face/Off. 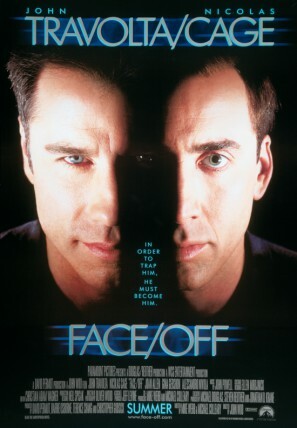 Face/Off was written and produced by the duo of Mike Werb (The Mask, Darkman III, Lara Croft: Tomb Raider) and Michael Colleary (Death Wish V, Firehouse Dog). The director for the film was action movie icon John Woo, who has been behind films like Red Cliff, Paycheck, Mission Impossible II, Hard Target, and Broken Arrow over his career. The cinematographer on Face/Off was Oliver Wood, who shot such movies as Die Hard 2, The Other Guys, Neon Maniacs, The Adventures of Ford Fairlane, U-571, The Adventures of Pluto Nash, and Rudy. Face/Off featured two editors: Steven Kemper (Legion, Timecop, Showdown in Little Tokyo, Aspen Extreme) and Christian Wagner (True Romance, Bad Boys, Furious 7, The Island). The other producers for the movie included actor Michael Douglas (Ant-Man, The Game, Falling Down), Jonathan D. Krane (Swordfish, Battlefield Earth, CHUD II: Bud the Chud), Steven Reuther (Hider In The House, Under Siege), Terence Chang (Paycheck, Windtalkers), David Permut (Captain Ron, Farce of the Penguins), Jeff Levine (Slither, 8MM), and Barrie M. Osborne (The Matrix, Cotton Club). The music for the film was provided by John Powell, and was his future-length film credit. He has since provided scores for movies like Antz, The Road To El Dorado, Shrek, Rat Race, The Bourne Identity, Gigli, Happy Feet, The Adventures of Pluto Nash, and How To Train Your Dragon, among others. 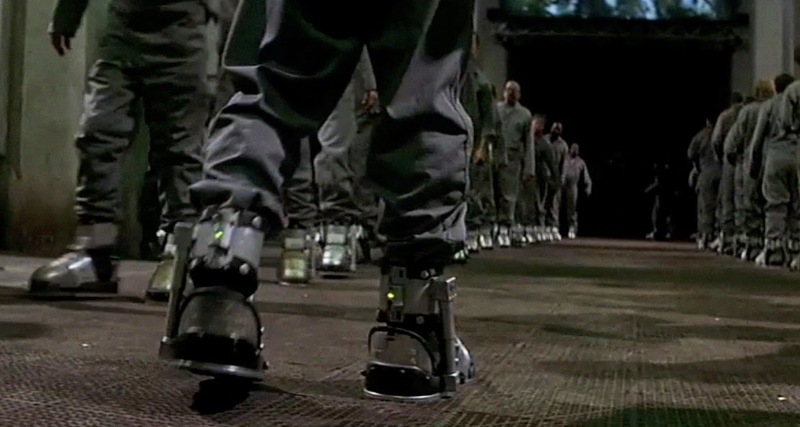 The special effects unit included such workers as Bryan Sides (Mimic, Species II), Robert DeVine (Wild Wild West, RoboCop 3), Tony Acosta (Bordello of Blood, Volcano), Joseph Mercurio (Mommie Dearest, 8MM), Henry Millar, Jr. (Young Frankenstein, Capricorn One), David A. Poole (Gigli, Waterworld), Anthony Simonaitis (Torque, Swordfish), R. Bruce Steinheimer (John Wick, Argo, The Running Man), and Richard Zarro (Class of 1999, Predator 2). The visual effects team for the movie included Allen Blaisdell (Red Planet, Dracula 2000, Theodore Rex, Shocker), Derry Frost (Epic Movie, Swordfish, Torque), Douglas Harsch (Dracula 2000, The League of Extraordinary Gentlemen), Richard E. Hollander (Winter’s Tale, Daredevil, Timecop), Mark Tait Lewis (Red Planet, Deep Blue Sea), and Scott Schneider (On Deadly Ground). The makeup effects in Face/Off were provided by a team that included David Atherton (Shocker), Ken Brilliant (Congo), Michelle Bühler (Swordfish, The People Under The Stairs), Grady Holder (Pick Me Up, Lake Placid, Small Soldiers, The Island of Doctor Moreau, Children of the Corn III, Waterworld), Nina Kraft (Con Air, The Rock), Mike Measimer (Stuck, Space Truckers, Castle Freak), Gilbert Mosko (Bratz, Star Trek: First Contact), Brian Penikas (Trick or Treat, Leviathan), Shaun Smith (Captain America, Children of the Corn III), Mario Torres Jr. (Hollow Man, Starship Troopers), Kevin Yagher (The Dentist, 976-EVIL, Trick or Treat, A Nightmare On Elm Street 2), and Mark Yagher (Starship Troopers, Sleepy Hollow). 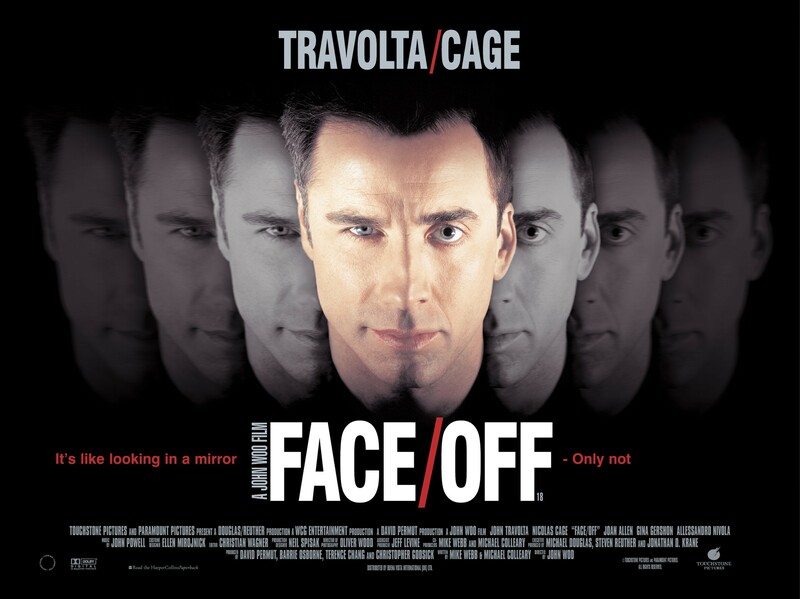 The cast for Face/Off includes Nicolas Cage (Vampire’s Kiss, Con Air), John Travolta (Battlefield Earth, Swordfish), Joan Allen (Pleasantville), Alessandro Nivola (Jurassic Park III), Gina Gershon (The Insider, Showgirls), Nick Cassavetes (Blind Fury, Class of 1999 II), and Thomas Jane (Deep Blue Sea, The Punisher). The plot of Face/Off follows an obsessive cop (Travolta) and his criminal arch-nemesis (Cage), who is captured after an intense sting. However, it is decided after the raid that Travolta must go undercover to foil a pending plot by Cage’s organization. In order to do this, he must pose as Cage, who has fallen into a coma with severe injuries. He goes through an experimental surgery to graft Cage’s face onto his own, and begins the operation completely off the books. Cage unexpectedly revives in police custody (sans face), and easily steals Travolta’s identity, thus turning the undercover plot upside down. What follows is an epic duel of mistaken identities and deception. Reportedly, John Woo insisted on leaving the slash in the title of Face/Off (in defiance of the studio) to ensure that people would not think that the film was about hockey. The original screenplay for the movie had the plot taking place in the distant future, which helps to explain some of the futuristic technologies showcased in the prion and the surgeries. John Woo is said to have specifically changed the setting to the present day to make the conflict more identifiable and dramatic. Mark Wahlberg apparently turned down the role of Pollox Troy, Nicolas Cage’s brother and right hand man in Face/Off. Other potential alternate castings had Stallone and Schwarzenegger in the lead roles, Patrick Swayze, Alec Baldwin, Bruce Willis, Steven Seagal, or Jean Claude Van Damme involved in some capacity, the Heat combo of Pacino and De Niro taking the leads, or the far more unlikely duo of Harrison Ford and producer Michael Douglas headlining. 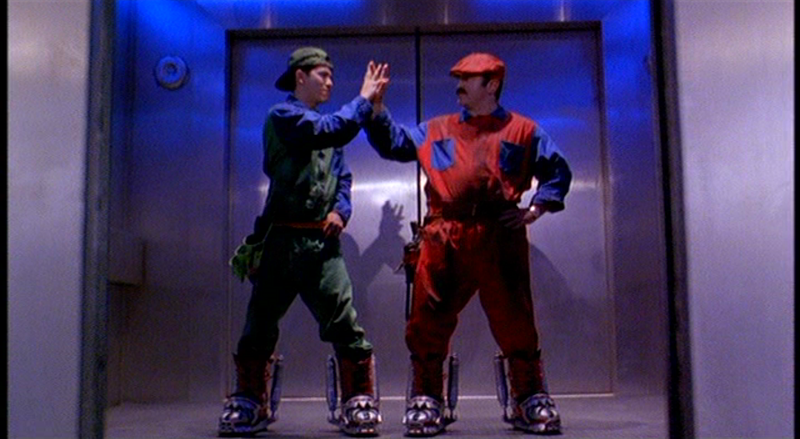 The high-tech magnetic boots worn in the prison sequences were reused props the featured prominently in Super Mario Bros., which released four years earlier. Face/Off was made on a significant budget of $80 million, on which it managed to gross over $245 million in its lifetime theatrical run. Critics and audience both generally liked it, and it is fondly remembered as one of the most bizarre action movies of the era. Currently, it holds Rotten Tomatoes aggregate scores of 92% from critics and 83% from audiences, alongside an IMDb score of 7.3. 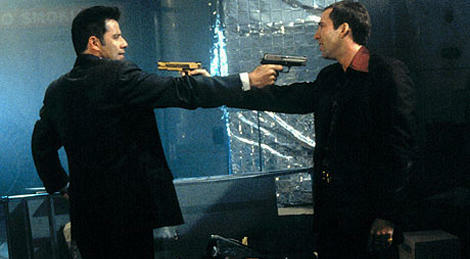 What is there to say about the joy that is Face/Off? This is a showcase of two of the hammiest showboats in the business, and they both fire on all cylinders here. The action and plot is fun (if not particularly smart), and there are plenty of highlights throughout the film. The only criticism I really have is that Travolta and Cage eclipse anyone else who dares to appear on screen, so the accessory cast is mostly just there to fill in empty space. That said: who cares? People went to this movie to see Cage and Travolta try to out-act each other, and that is exactly what is delivered with Face/Off. If you haven’t seen Face/Off, this is absolutely an essential of the action genre. I feel like this should go on a high shelf of honor next to Tango & Cash as one of the most ridiculously fun, silly action movies of all time. If my word isn’t good enough for you, check out The Nostalgia Critic, How Did This Get Made?, and Gene Siskel and Roger Ebert, who all have plenty to say about the film.